Krugman – Are we getting close enough to Full-employment? I understand his concern that a low labor force participation rate and “sustained high unemployment” represent scars forming in the economy. Basically Krugman wants the Fed to maintain its aggressive policy for encouraging spending and investment in the economy, since there is evidence of spare capacity in the labor force. The problem is that Krugman is still assuming that we will approach full-employment. He is being foolish. Why? Keynes wrote in Chapter 3 that a deficient effective demand can keep an economy from reaching full-employment. Thus it logically follows that we should not simply assume full-employment. Effective demand is deficient now, since labor share of national output has fallen. Labor has less liquidity to purchase output. If Krugman would follow his own story of the child care coop where not enough scrips caused a “recession” in the coop, he would see that low labor share shows that labor has less scrips. The result is that the potential output of the economy is lowered to a point constrained by labor’s liquidity. This is Keynes’ thinking behind effective demand. The question then is… Where is full-employment? … Answer: The employment where effective demand constrains output. In this scatter plot graph of quarterly data, unemployment is plotted against the percentage difference between capacity utilization and the effective labor share. (Effective labor share is the measure of labor share which determines the effective demand limit upon the utilization of labor and capital.) The data is from 1967 to 2nd quarter, 2013. 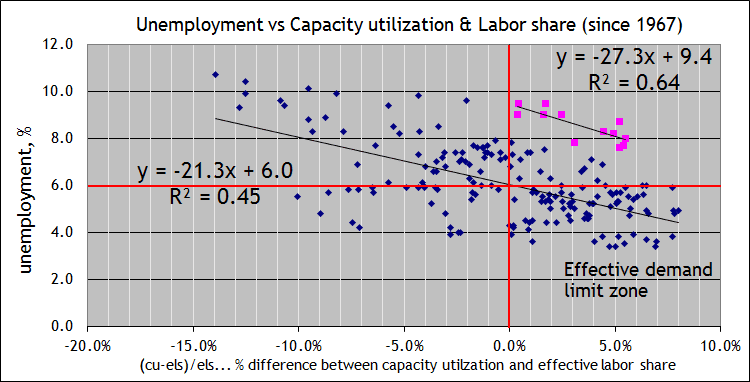 In the x-axis, capacity utilization increases in relation to effective labor share. We can see that since 1967, capacity utilization does not go much beyond 7% over effective labor share, and not much beyond 6% since the 1980’s. But at the same time, we can see that unemployment on the y-axis falls to a limit itself around 3% to 5%, as capacity utilization reaches its limit. The pink dots show current data moving to the right. Capacity utilization is about 5% over effective labor share. Normally since 1967, unemployment would have been between 3% and 6%. However, unemployment is now at 7.3%. My assumption is that Krugman would look at this graph and expect unemployment to fall to 6%. But what trend line would unemployment take to reach 6%? The current trend line would imply a 6% unemployment when capacity utilization is 12.5% over effective labor share, or in other words, a capacity utilization rate of 83%. It is not likely that unemployment will reach 6% on the current trend line. Capacity utilization has been stuck around 78% for over a year and is not about to rise that much. 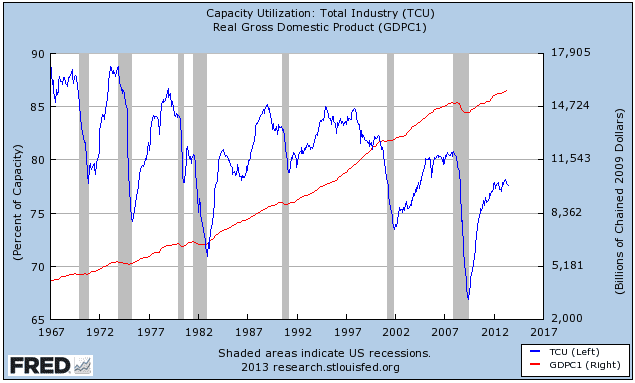 One looks at this graph and sees it is crazy to think that capacity utilization will move up to 83%. So Krugman would then have to assume that unemployment will curve radically downward in graph #1, in spite of unemployment having never done this since 1967. Would it even be possible for unemployment to come down as capacity utilization stays steady? Not likely. More capital would need to be employed as more labor is employed. Graph #1 shows us that as capital and labor utilization rates approach the effective demand limit, the dots become a bit more tightly bunched, meaning there is less vertical movement. Krugman would have to have vertical movement for unemployment to drop to 6%. 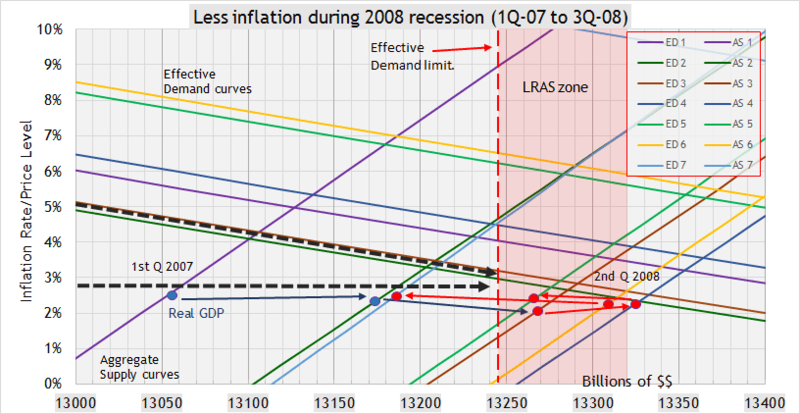 Vertical movement is not seen in the historical dynamics when the economy is approaching the effective demand limit.. Thus, I assume that unemployment is actually closer to its full-employment “constraint” then Krugman. I see a full-employment constraint at around 7%. The constraint is based on deficient effective demand as determined by labor’s share of national income, which is primarily used for consumption of finished goods and services. One could use Krugman’s own story of the child care coop to understand how low labor share constrains output, and thus the potential to use spare capacity. If Krugman looked at graph #1, and saw that unemployment is actually closer to its full-employment “constraint”, would he see evidence that the economy “is really approaching capacity”? Would he change his answer to his question? He has recently been saying that the economy will eventually improve of its own accord in spite of austerity. And here too, unemployment will reach its full-employment “effective demand” constraint, with or without QE. So why entertain all the risks associated with QE, namely zombie businesses, more inequality, a divided country, bubbles here and abroad…? He talks about political power in determining which economic theories get applied. He talks about fiscal policy. He mentions that trying to re-work supply side reforms while the markets are weakening in demand can be unproductive. Many other good points in the interview. From my own perspective… The reason that effective demand will keep real GDP from reaching potential output is because labor share of income has fallen. Thus a consequence is deficient aggregate demand, in the sense that demand has the effective potential to only take us part way to potential supply output. Nick Rowe brings up an important issue and sends a warning. He says that New Keynesian economists are assuming full-employment. And it is foolish. Nick Rowe is correct. Keynes himself talked about how effective demand could stop output before full-employment is reached. The cause is deficient effective demand. And through the research that I do, I have been saying that effective demand is about to cut off output growth from reaching potential output. I show graph after graph of how it happens. The New Keynesians take the CBO projection of potential GDP as a given and in effect assume we are on our way to full-employment. It’s not going to happen. Their assumption is foolish and would not be shared by Keynes himself who told what happens when there is deficient effective demand. Thoma, Krugman, Delong, the Fed, Yellen and others are all assuming a return to full-employment at the CBO potential GDP. Nick Rowe is signalling a warning and others had better pay attention, because this is not a trivial issue. Will there be inflation in the next recession? 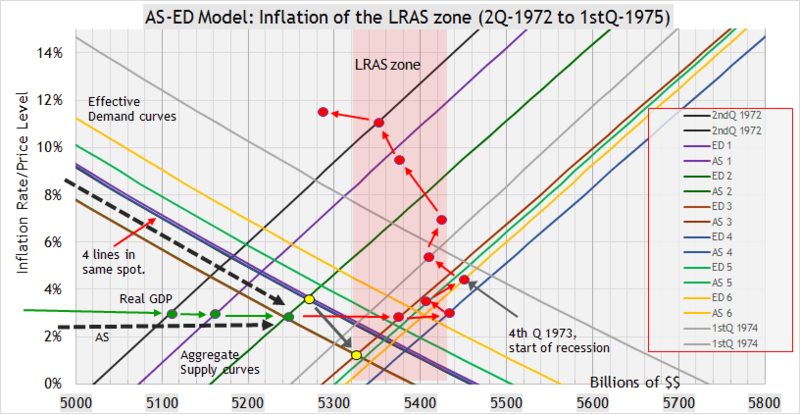 So it is more than obvious that the inflation jumps were created in the LRAS zones as the economy went into recession during the 1970’s. But there were forces to produce inflation. Even though the Fed rate was balanced to bring inflation down to 3% during the 1970’s, inflation moved from 3% before the 1973 recession, rose to 11% during that recession, fell to 6% after that recession and then rose again to 13% during the 1980 recession. In spite of correct Federal Reserve policy, the financial sector kept feeding the economy and creating money even at higher interest rates. The mood of growth and optimism emanating from the baby-boomers kept the money supply growing in spite of higher interest rates. A higher Fed rate did not matter so much in that atmosphere of growth and decadence in the 1970’s. In essence, society did not respect the intent of the Fed rate to control the economy. They borrowed and the banks lent money. Money was created in spite of a higher Fed rate. We saw no inflation result as real GDP reached the effective demand limit. 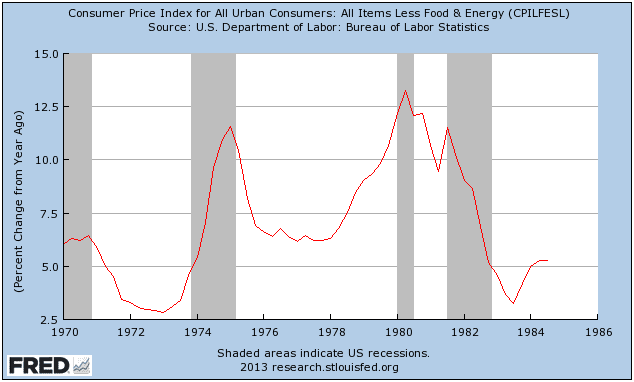 The factors underlying a strong inflation were not there as they were in the 1970’s. There is more debt overhang now. Net worth took a hit as the bubble popped. The baby-boomers are leaving the labor force to some extent, or are keeping jobs that could make room for younger workers. Also, there isn’t the mood for growth in spite of interest rates. We see the same typical pattern before a recession. Real GDP is trending horizontal at a low inflation rate, while effective demand trends toward the meeting place with real GDP. Where they will meet establishes the LRAS zone. 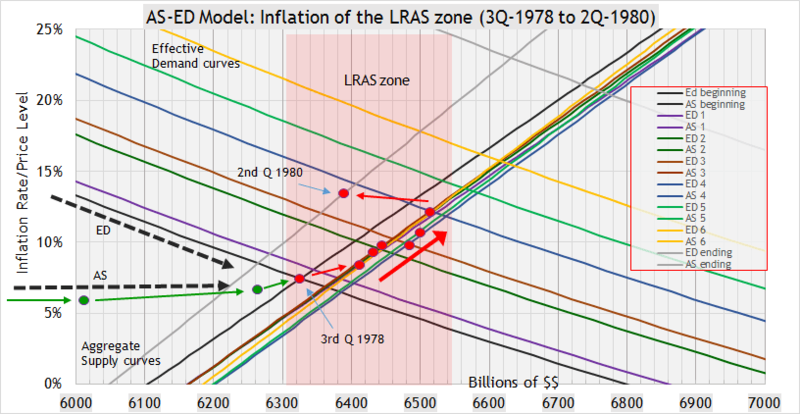 What will inflation do as real GDP enters the LRAS zone? Are there dynamics to support a big rise in inflation? I do not see those dynamics. More baby-boomers will leave the labor force. There may even be a bubble popped to bring down net worth. Debt overhang will still be there. Labor has no power to ask for higher wages. Will we have deflation? 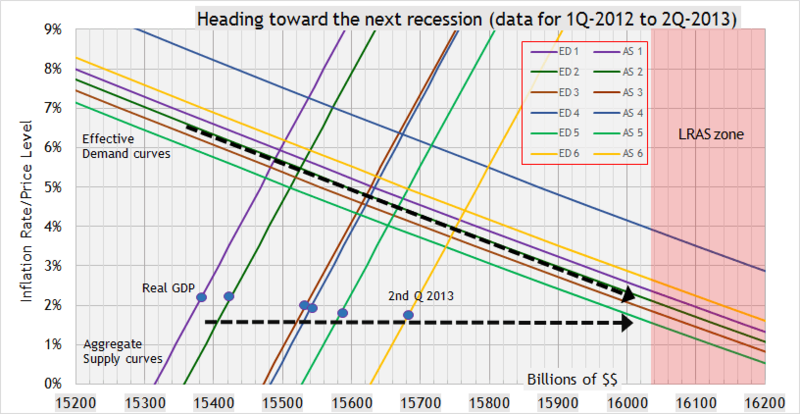 Most likely we will see an effort by inflation to rise, but if there is a bubble popping sound, inflation will back off. Pretty much as we saw in 2008. Deflation may be stronger in the next recession. Will the next recession be dramatic? Oh yes… there will be labor issues, student default issues, government debt issues, deflation issues, derivatives issues, emerging market issues, on-going QE issues and more. Has the Fed rate done a good job to balance inflation over the years? In light of the recent discussions of inflation in the 1970’s (Steve Roth and Steve Randy Waldman), I ask… how well has the Federal Reserve done in setting a Fed rate to balance inflation over the years? Including the 1970’s… Actually very well, except for Volcker in the 1980’s. First, let me state that there was liquidity from high labor share through the 1970’s. Even though real wages were lower, labor’s share of income did not change much. The baby-boomers grew in economic strength from their labor share liquidity. The Fed rate did not try to control that liquidity in the 70’s. But Volcker put the breaks on the liquidity coming from the Fed rate in the early 80’s. And the babies born from 1960 on graduated from college into a world of tight liquidity due to tight Fed policy. They became disadvantaged. They did not find job openings. As a generation, they fell behind. I was one of those babies that graduated into the heart of the 1982 recession. If the Fed “had gone Volcker in 1975”, as Steve Roth asks in his post, what happened to my generation would have happened to the baby-boomers before me. During the posts about the percentage rate of capital income used for consumption, it seemed readers were not sure how I calculated the number. Well, I want to show here how I calculate the percent of capital income used for consumption. The number is currently rising from quarter to quarter. When it begins to fall, a recession is appearing on the horizon. So the method below can be used by anyone for recession forecasting. 1.) I get a blank circular flow sheet ready for inputting data. 3.) Then I convert the last line for “Government net borrowing or net lending” from 2013 dollars into 2009 dollars by using a converter which uses the GDP deflator. Here is one. The $1185 in graph #2, now becomes $1116 in 2009 dollars. 4.) Next I input that data into the blank circular sheet. You will notice that the GDP at the end does not equal the real GDP in graph #3. There is always a residual from line 27 of table 1.1.6. So, consumption, Govt. spending, Investment and net exports add up to a different number than the real GDP given in line 1 of that table. 5.) Now using the data we can proceed to determine the consumption rate of capital income. It is a process of deduction getting one number, then another, until we get the number we want. In this step, let’s go ahead and complete the bottom section. There are 3 numbers to obtain. 6.) Now I start filling in the top. 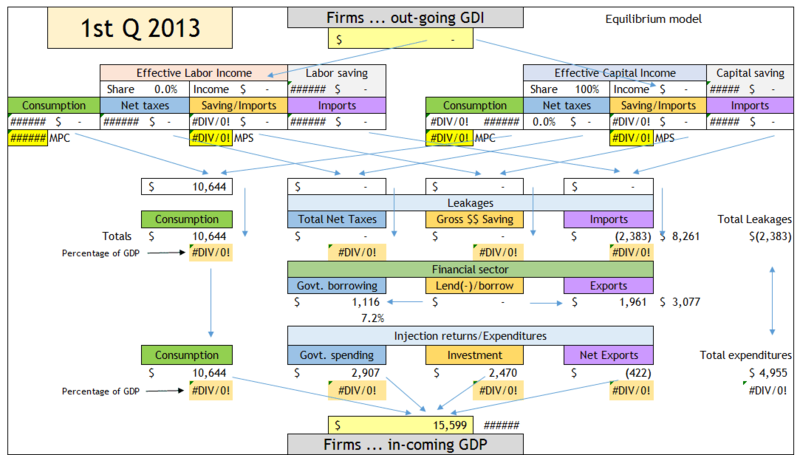 The first step is to put the real GDP from below into the out-going GDI at the top. Then I input the effective labor share percentage of national income, which in 1st quarter 2013 was 73.9%. The effective capital income share will also be filled in as labor share and capital share add up to 1. The incomes of labor and capital are calculated from their shares. The method of calculating effective labor share is to download the data for the labor share index from this graph at FRED. Then take the index for the quarter in question and multiply it by 0.766. For example, for 1st quarter 2013, the index 96.465 times 0.766 = 73.9%. 7.) The next step is to determine the effective net tax rates for both labor and capital. For capital’s effective tax rate before 2003, I use Jane Gravelle’s data. For data from 2003 to 2011, I use Wikimedia. For data after 2011, I can only estimate. The estimation looks for a balance of movement between the labor’s effective tax rate and the capital’s effective tax rate. In this case for 1st quarter 2013, I set the effective capital tax rate at 15.5%, which gives a capital net tax of $631 billion. I subtract $631 b. from $1791 b. of total net taxes to get labor’s net taxes of $1160 b. Then I can calculate labor’s net tax rate by dividing labor’s taxes, $1160 b., by labor’s income, $11,528 b. The result gives a labor tax rate of 10.1% of labor income. If the capital tax rate had produced a labor tax rate around 5%, I would assume the capital tax rate was too high. and if the capital tax rate had produced a labor tax rate of 20%, I would assume the capital tax rate was too low. Normally the labor tax rate is less than the capital tax rate, so in this case the estimation “seems” balanced. 8.) Now we take the personal savings rate from graph #2, which is 4.1%. I apply this to the labor’s disposable income income of $10,368 b. which is labor income, $11,528 b, minus labor’s net taxes, $1160 b. Thus labor is saving 4.1% of $10,368 b., which is $425 b. You can see the personal saving rate in the yellow box. The 3.7% is savings as a percentage of total income, not just disposable income. 9.) Now I determine labor’s consumption by subtracting savings and net taxes from labor income.Labor consumption = Labor income – labor net taxes – labor savings = $9943 b. 10.) Now that we have labor’s consumption and we know that total consumption is equal to labor’s consumption plus capital’s consumption, we can determine capital’s consumption. Then we can easily determine capital income’s rate of consumption by dividing capital consumption by capital income, $701/$4071 = 17.2%. There… we don’t need to do any more with the sheet. I realize that the information for capital income is still not complete in graph #10, but we don’t even need to complete that information. You don’t have to fiddle with imports, exports or even capital savings. We already know the number we want for recession forecasting, which is 17.2% of capital income is being used for consumption. We can use the same calculation method for any quarterly or annual data. For future data, when you see the consumption rate of capital falling, think recession on the horizon. One person made a comment on a past post that capital gains taxes change wildly and would affect the calculation. However. if you keep a close balanced eye on labor’s net tax rate, you will spot noise in capital’s tax rate. The key is to hold a steady line with informed adjustments about tax revenues. Then what you end up with is a core rate, similar to core inflation that seeks to clean out the noise. The data used for capital income’s effective tax rates do not show noise from capital gains taxes anyway, so the method above is safe to use for recession forecasting. Everyone needs to have the advantage to protect themselves well before a recession starts, not just those with their fingers on the pulse of capital. Everyone… Now with the above method, labor has its fingers on capital’s fingers. Everyone, including the stock market has a way to know quarters in advance that capitalists as a group are tightening their belts. There is no way to hide it. Nick Rowe says it is hard for an economy to get stuck in a Liquidity trap, but it is actually easy. He goes through some scenarios that would put an economy in a liquidity trap … and then shows that a reversal in monetary policy could pull the economy out of the liquidity trap. He then presents an idea for inflation inertia that could put an economy into the trap, and it would be hard for monetary policy to pull an economy out. Well, it is not really that hard to put an economy into a liquidity trap from which it cannot escape. Basically, you lower labor share of income below a certain threshold et Voilá… you are stuck in a long-term liquidity trap, irregardless of monetary policy. On the y-axis we see the prescribed central bank interest rate. On the x-axis we see a value called the TFUR, which is simply multiplying the capital utilization rate by the labor utilization rate. The TFUR gives a measure of a total utilization rate for the factors of production, namely labor and capital. 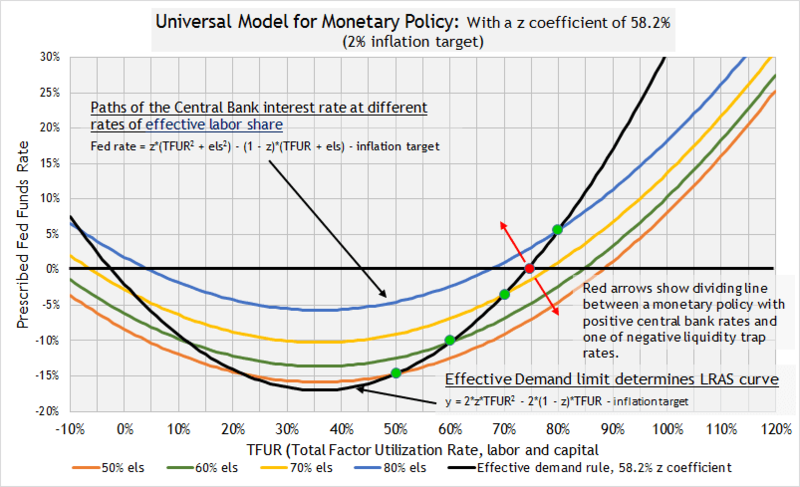 This graph shows the paths of a central bank interest rate based upon the utilization of the factors of production. Each path is determined by the labor share of income. So the blue line uses a higher labor share of income than the yellow line. The orange line below uses the lowest labor share measure. As you move from lower to higher labor share, the prescribed central bank interest rate would rise in response. Thus, as labor share falls, the corresponding central bank interest rate would fall too. z = the coefficient of the equation which corresponds to the labor share anchor… els = effective labor share which is a measure of labor share that determines the effective demand limit. 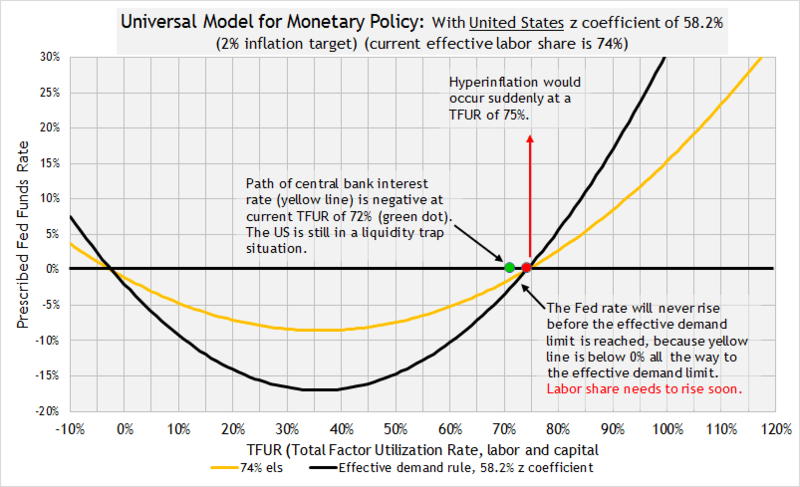 To get stuck in a liquidity trap, the path of the prescribed central bank interest rate would have to fall to a level below the zero lower bound. You will notice that all the paths will eventually rise to the right above the 0% lower bound. However, the black line with the green dots is the effective demand limit. 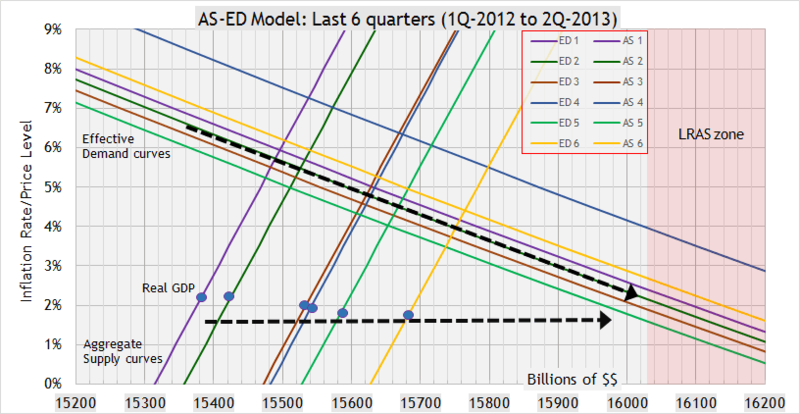 The TFUR, according to data since 1967 for the US, will not go much beyond the effective demand limit (black line). 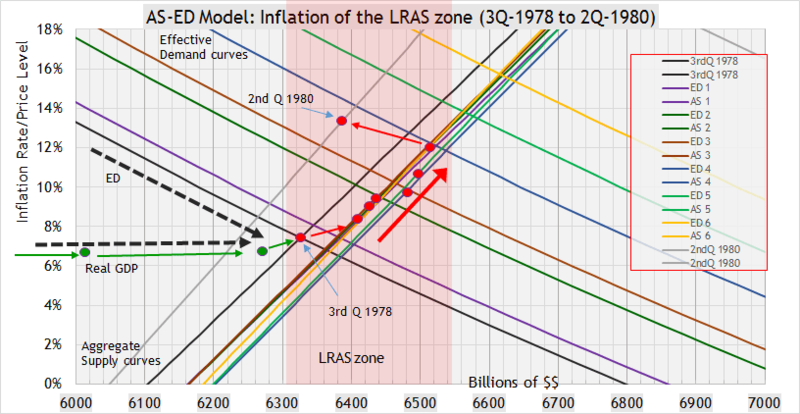 So if a path goes positive to the right of the black line, or better yet, passes below the red dot, the central bank interest rate will get stuck on the red dot, the crossing point between the zero lower bound and the effective demand limit. For example, the yellow line goes positive at a TFUR around 78%. The effective demand limit is at a TFUR of 74%. Thus, the economy will not reach a low enough unemployment rate or high enough capital utilization rate to bring the central bank interest back into positive territory. 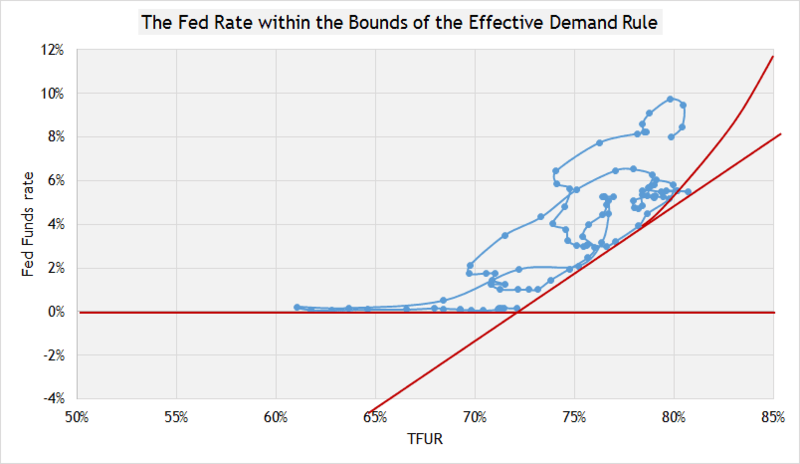 You can see the Fed rate moving along the zero lower bound all the way to a TFUR of 72%. The TFUR is currently around 72% and the Fed rate is still at 0%. Do you see the point where the zero lower bound and the diagonal line meet? That point is shaping up to be the lockout point, which means the economy is stuck below the zero lower bound. The Fed rate can get stuck at the zero lower bound due to a low labor share of income. The diagonal line is based on labor share. Graph #3 shows the current situation in the US where the effective labor share is holding steady around 74% after falling 5% since the crisis. So the path of the Fed rate has fallen from above the red dot to below the it, since the crisis. The Fed probably did not see that coming. The path of the Fed rate goes along the yellow line. We can see that the yellow line passes just below the red dot, but not above it. The result is that the US Fed rate is stuck on the zero lower bound of the liquidity trap no matter what US monetary policy does. What is the basic mechanism of the effective demand limit? The amount labor is paid determines a limit upon utilization of labor and capital. What business gives to labor sets a limit on production… and the limit says that the product of the utilization rates of labor and capital will not go above the effective rate of sharing income with labor. How do you get an economy stuck in a liquidity trap where monetary policy won’t work to get it out. It’s as easy as apple pie. Just lower labor’s share of national income. How do you like them apples? Welcome to a new economic paradigm. Is the current aggressive monetary policy effective? Do the risks outweigh the benefits? I think the same way and many others do too. Aggressive and loose monetary policy definitely helps the economy bounce back from a recession, but the economy still must function within its own constraints. Monetary policy can try to push the economy beyond a natural GDP level, but the result would most likely be inflation or bubbles as noted in Mark Thoma’s quote. How one judges the risks and benefits of monetary policy is based on one’s assessment of what the economy is capable of. Many economists like Thoma and Krugman look at the high unemployment rate and spare capacity and say the economy will eventually return to full-employment below 6% unemployment. To me that is a view with rose-colored glasses that disregards Keynes’ concept of an effective demand limit that can cut an economy short of full-employment. The principles of the effective demand limit are really an unknown. But what I understand in Thoma’s words is there is a view that once monetary policy stabilizes the financial system, the economy then runs its course. Monetary policy can affect the course of the economy within limitations, but is more limited when at the zero lower bound like now. My view, which is based on seeing an effective demand limit that will stop unemployment around 6.8% to 7%, is that the Fed must be very careful being too aggressive. It’s like driving too fast on an unknown road and not knowing there is a stoplight ahead that is turning red. That stoplight is the effective demand limit based on low labor share of income. In this scenario, the risks outweigh the benefits from aggressive monetary policy. Bubbles are more likely than inflation due to labor income unable to push inflation. Bubbles come from owners of capital, whose income has rebounded extremely well since the crisis.